So I was having a ‘Case of the Mondays’ today. The thing that kept me going through the day was that I was wearing fleece lined pants today. Soo cozy…. 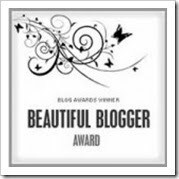 Well all this craptasticness changed when I check my RSS feed at lunch and saw that Diana at Front n Center gave me the Beautiful Blog award. So trilled!!!!! So here I am out of my Monday funk getting to award a few of my favorite blogs with this lovely award and share 7 random things about me. 2. I can’t dance. Really, I have no rhythm. I try to count in my head but it only gets confusing. 3. Love the show Glee. 4. I’m currently growing my hair out for my Halloween costume. Needs another 6-8 inches. 5. I am agnostic but LOVE to read books on religion and too a class on world religions this past summer. 6. I can’t go to a place without yelping it. 7. House centipedes terrify me to the point of frozen stuff or running as fast as I can. So now you have to pass this award on to 3 fellow bloggers and share 7 random things about yourself. Spread the wealth!